New York mayor Bill de Blasio says his role is to be "vigilant against future terror". On the 13th anniversary of the September 11, 2001 attacks, New York mayor Bill de Blasio said on Wednesday that such an attack could happen again. "The responsibility I have today was generated by that horrible day," de Blasio told The Associated Press in an exclusive interview. "My role now is to look out for the first responders who have fallen ill since then and to be ever vigilant against future terror," he added. The anniversary, which will be marked Thursday in a solemn ground zero ceremony that de Blasio will attend, comes amid new terror worries for the nation's largest city. While there is no specific threat against New York at the moment, air strikes in Iraq, unrest in Syria and the rise of the Islamic State (IS) present the most complex terror danger since 2001, NYPD officials said this week. 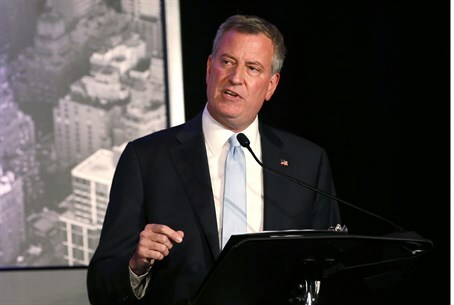 De Blasio, a Democrat who took office in January, said his administration views the rising threat of IS as a reminder that "you can never rest on your laurels." "No matter what's in the news, we're in a perpetual state of readiness," the mayor told AP. "I don't think it feels that different than a year ago. We were already the number one target a year ago and the year before that. I do not expect that to change in my mayoralty."